Luke Brothers Floor Covering offers over 4,000 area rugs and hundreds of runners to choose from. 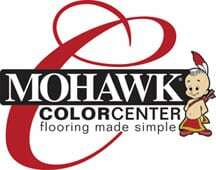 Mohawk Select area rugs are your premium choice when it comes to design, color and value. Our dedicated rug designers are constantly creating the new looks that you want. Mohawk Select woven products are made from durable fiber that offer a soft hand, easy care, and exceptional value. The line has the cool styling today’s consumers want, at prices that are extremely attractive. Look at the latest styles and you can see how much fun consumers are having decorating their homes. The latest innovations from Mohawk Select showcase the trends toward fresh color, carefree patterns, and movement-oriented designs in area rugs. Mohawk Select’s new Decorator’s Choice offers versatile patterns including retro-modern inspired graphics, bold scale transitional patterns, Asain inspired geometrics, and painterly compositions that become “art for the floor.” The color palette is deep and rich, featuring dark orange, melon, avocado, moss, butter, camel, coco leaf, deep lavender, crimson and jet black.